Fall is getting colder. That means wool comforts, tea, reading and movies. And also as always, photography. This weekend I've decided to do some more decoration, write letters and draw. Wrapping myself up in layers of wool I'll be heading out for photography, and visit a museum or go swimming. I love notebooks. They're my favorite thing to decorate. I think they are nice to surprise friends with :) Some I'll use as decoration. I've been reading The Lord of the Rings and will definitely pick it up this weekend. I quickly go from on book to the next, having to many at one time. About movies. I might go for The Lord of the Rings :) They're timeless. What are you reading now? :) Do you have favorite movies/books around Christmas time? Makeup brushes has come to stay in my beauty stash. They are so practical and easy to use. I don't think I will ever go tired of them. On my wish list is an extra rouge brush or two, and perhaps a new foundation brush as well. I've been thinking about buying a new foundation. And a rouge. Good quality brushes will last for a long time. I think they're a nice investment. Makeup taste and collection changes. About makeup. I've come to love this product that I hated first. When I combine it with the right foundation it looks good. I only need a little bit of the lipstick each time, so it will last for long. And maybe still be a staying favorite. I received these products a couple days ago. I can not remember the last time I wore eyeshadow. It's probably a couple years ago. And powder is also a seldom product in my makeup bag. 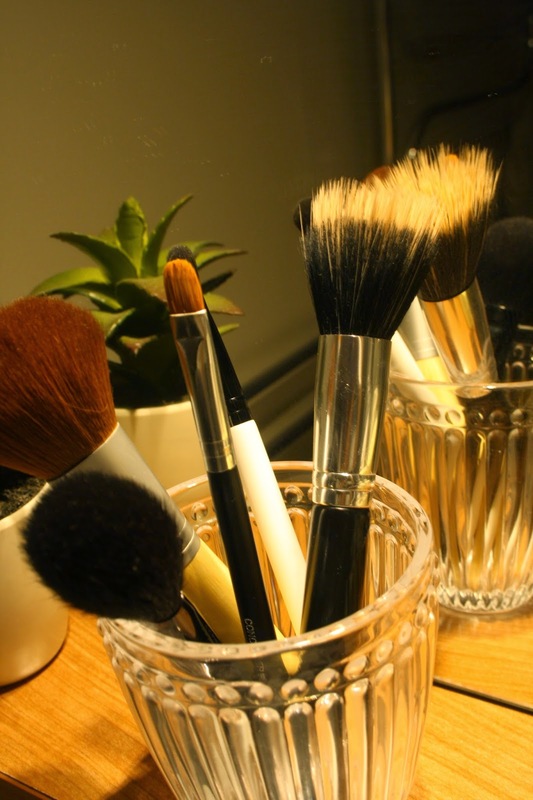 Lately I've become very found of using makeup brushes in my makeup routines. I ordered this powder brush. It was absolutely amazing. Very comfortable and easy to work with. Also I tried the eyeshadow trio and the color combination worked really well. Usually sparkling makeup makes me a little skeptical, since they often have to much sparkle. These were nice. I also have the two highlighters. They look wonderful. That type of makeup is new to me. Probably all products will end up in my makeup bag soon. And some as staying favorites. Something spring and autumn. Fall seems to have all colors in one season :) Yesterday I saw a bush plant with white berries which reminded me of christmas. Probably a christmas movie. I can not remember having seen such a plant before. Having so many colors to photograph makes it more inspirational :) I wonder what to look for when winter come. I've really enjoyed photographing colors. Cosmetics. A while back ago I bought this facial cleanser from one of the brands that has caught my attention. Having a couple, favored items from their brand I decided to go for this one. I'd been needing a new facial cleanser for a while and decided to go for a product that would not be too different from the products I already use. As I brought my camera with me for a walk, I decided to look for color contrasts for most of my photos today. I spent some time in the garden under the big, yellow tree. 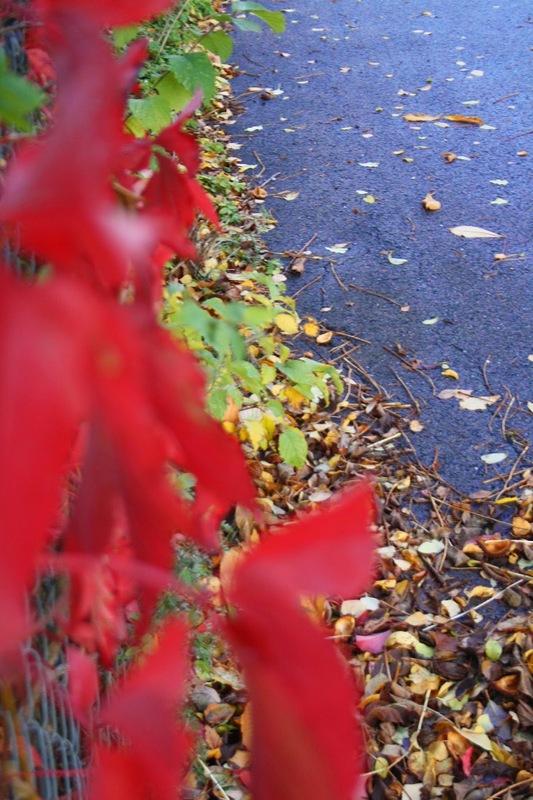 I think especially the photos with the red leaves came out nicely. Earlier this day I had a nice meal and watched one of my favorite movies called Inception. I found my green tea here the other day at a cafe :) This combination has pieces of apple, hibiscus flower, raspberry and more. It tastes good. Still. I think I can find better. This time at fall there are so many colors. The trees, the flowers still alive. They all make it a wonderful experience for photography. Just walking outside my door there are so many beautiful colors popping up. This time a year winter is threatening to sudden bring its cold weather and grey clouds. During autumn, a season for something new and changes, my health condition has been standing still, like always. We have winter ahead. For the first time in many years I am not dreading for that change to come. And no matter how grey the sky is, I'm determined to find something nice to photograph. This autumn has not brought any big changes, nor has things been depressingly frozen. Days go by, and I make smaller changes to create bigger ones. The last couple of years I've had a tea addiction. If I walk by a store and I see they have a tea selection I will always enter that store. I drink at least one cup a day. Often two. I think the classics can be nice, usually though the other ones end up in my bag. What I love about this addiction is the affordable price, and then tea can be quite healthy. Lately I've been drinking white tea, a black tea lemon blend and white tea with raspberry. For a long time, I've been wanting a green tea with strawberry and orange, or something similar. Usually I don't come across combinations like that. Hopefully soon I'll do. If not. I might spend time on the internet searching and searching some more. White tea with flavor is good, but green is my favorite choice.